In the NASCAR Camping World Truck Series (NCWTS) season finale at Homestead-Miami Speedway, Burton put on a show for all spectators when he quickly climbed his way into the top five and gave seasoned NASCAR veterans a run for their money. The 21-year old thought his night was over when his Arrowhead Chevrolet made contact with the wall with only ten laps to go, but that didn’t stop him from giving it his all. Restarting just outside the top-20, Burton battled back to a third-place finish after multiple green/white/checkered attempts and ended his rookie season with a top-five spot in the NCWTS Driver Point Standings. In his first visit to the 1.5-mile track, Burton spent Thursday afternoon studying the layout, getting tips from his Turner Scott Motorsports (TSM) teammates and watching race footage from previous years. When track activity began on Friday, Burton used the day’s only practice session to get more acquainted and master his line. The young driver’s determination paid off when he jumped to the top of the speed charts after running 50 practice laps. In his qualifying effort, however, Burton drove his Chevy Silverado a bit too hard and placed the No. 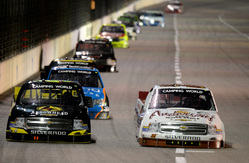 4 truck in the 15th position for the start of the Ford EcoBoost 200. The No. 4 Arrowhead truck didn’t stay out of the top 10 for long. 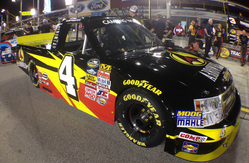 Within the first 20 laps, Burton had climbed his way into the seventh position and said his truck felt “awesome.” Throughout the race, Burton ran consistent lap times, many of which were the same as the leaders, and the TSM team performed impressive pit stops,which helped Burton break into the top five by the halfway mark. 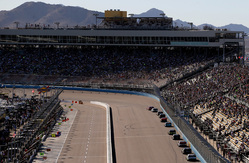 In the second half of the race, the rookie driver found himself in several tough battles for the lead with NASCAR veterans Kyle Busch and Austin Dillon. Having settled into the second position with less than ten laps remaining, crew chief Mike Hillman Jr. told Burton, “It’s time. Go get ’em!” When a determined Burton made an effort to take the lead, however, his No. 4 Arrowhead truck made contact with the wall, sending out a caution and allowing the TSM team to repair minimal damage and provide four new Goodyear tires. Restarting outside of the top 20, Burton fought his way back into the top 10 before another caution arose, followed by another. In the final attempt at a green/white/checkered finish, Burton put on a show as he charged to gain even more track position, crossing the finish line in the third position. In an impressive rookie season, Burton added one win, five top fives and ten top 10s to his racing resume. In his 22 starts, Burton led a total of 289 laps and received seven Keystone Light pole awards, sharing the NASCAR record with Austin Dillon. Having remained in the top five in point standings throughout the year, the young driver finishes the 2013 season in fifth place in the NCWTS Driver Point Standings. After starting Friday night’s race in the 17th position, Kennedy was in the 19th position when the first caution of the race came out. Kennedy radioed in that his truck’s balance was pretty good and he could get back to the throttle well. After the restart on lap nine, Kennedy worked his way up to the 17th position when the second caution came out at lap 42. Kennedy relayed to crew chief Chris Carrier that he was a little bit loose all the way around. Carrier called the No. 30 Florida Lottery Silverado down pit road for four Goodyear tires, Sunoco fuel and adjustments. After restarting 21st on lap 46, Kennedy maneuvered his way up way up to the 19th position when the third caution was displayed at lap 65. Kennedy communicated to Carrier that he was free on entry and exit, and a little tight in the center. Carrier called Kennedy down pit road to change four tires, add fuel and make adjustments. After restarting 17th on lap 70, Kennedy was in the 21st position on lap 80 when he radioed in that his oil temperature was really high. Upon inspection of the No. 30 Silverado’s grille, spotter Jimmy Kitchens reported debris blocking the grille opening. Kennedy worked to get behind another competitor to maneuver his truck back and forth in hopes of removing the piece of trash. Fortunately, the oil temperature dropped back to a comfortable level and Kennedy was in the 21st position when the fourth caution came out at lap 95. After coming down pit road for service, Kennedy was lining up on the track when he radioed in that his motor was sounding flat. After agreeing with Kennedy, Carrier told him to drop to the rear to prevent from stacking up the field. After restarting on lap 100, Kennedy maintained the 25th position until the fifth caution came out at lap 103. Carrier called the No. 30 truck down pit road and raised the hood to investigate the problem. After further evaluation under the hood, the team determined the No. 30 Florida Lottery Silverado had dropped a cylinder and would have to go to the garage, ultimately ending Kennedy’s night early. The No. 30 Florida Lottery Chevrolet Silverado finished the season finale at HMS in the 30th position for TSM. Looking to close out the 2013 NASCAR Camping World Truck Series (NCWTS) on top, James Buescher and his Rheem team wouldn’t go down without a fight. After a sixth-place starting position for the Ford EcoBoost 200, Buescher searched around the 1.5-mile oval for a groove in which was suitable for his Rheem Chevrolet. Running inside the top-10 for most of the night, slight contact with another competitor forced Buescher down pit road multiple times for repairs to his left front nose. These unscheduled pit stops forced Buescher to give up valuable track position and put him deep in the field for the eventual three attempts at a green-white-checked finish. Not giving up, Buescher stuck his No. 31 Rheem Chevy in some tight spots in the final laps to bring home a 13th-place finish in the NCWTS season finale at Homestead-Miami Speedway. With just only one practice session available to the teams,, the Rheem team went to work on finding the right balance for their Silverado. Battling a tight-handling race truck much of the two hour practice session, the Rheem crew hit on a set up that would place them third quickest on the practice charts heading into the qualifying session later that afternoon. Buescher was able to back up his practice times with a solid sixth-place starting position for the scheduled 134-lap Ford EcoBoost 200. When the green flag released the 36-truck field for the final time in 2013, Buescher found himself in some tight battles inside the top-10. While running in the seventh-position, the yellow flag slowed the field on lap six for a piece of debris. When the field got the green again, they picked up where they left off with some feverish battles throughout the field. Buescher eventually settled into ninth-place and would hold that position until the first round of pit stops on lap 43 after the yellow was displayed. Complaining of a tight-handling race truck, crew chief Michael Shelton called for four tires, fuel and an air-pressure adjustment. Restarting in the eighth spot, Buescher went back to work, trying to reel in the top-five. On lap 55, Buescher radioed back to his crew that his Rheem Chevrolet was still tight and that he believed he had some damage on the left front of his nose when close racing action found that a competitor slid up into Buescher. Hoping for a yellow flag to come work on their truck, the Rheem team worked to fabricate a patch in which they would use to put over the damaged area of the Silverado. The Rheem crew got their opportunity to come down pit road multiple times on lap 66 when the third yellow flag was displayed. With their truck repaired, Buescher gave up valuable track position and would restart 23rd. Buescher went to work and started to pick up positions one-by-one, eventually getting up to 17th before the next yellow was displayed on lap 94. After coming down pit road to work on his tight handling truck, the Rheem crew gave Buescher four fresh tires, fuel and made a track-bar adjustment for the shootout to the checkered flag. This wouldn’t be their last pit stop as a flurry of yellow flags would be displayed and different strategies would start to take shape. On lap 132, just two laps before the end of the scheduled distance, Buescher ducked down pit road for two right-side Goodyear Wranglers. Buescher would restart in the 10th position. Buescher tried to hang on to his top-10 but two more yellow flags sent the 2013 NCWTS season into overtime. Buescher weathered the tight quarters racing and was able to bring his Rheem Chevrolet home in the 13th-position and third in the NCWTS Drivers Point Standings.